There are few things a man needs in life: a sense of purpose and ambition, a clean bill of health, and a fully detailed hand-sewn puppet of himself. Listening to your cries for more custom handmade puppets that look just like you, Puppet Artists. From the mean streets of Darby, Montana, PA's a husband/wife puppet-making team who'll hand-sew and plushify to an insane level of detail the likeness of anything from fantasy characters (Yoda, Cat Woman, Captain America), to musicians (Willie Nelson, Steven Tyler, all members of KISS), to people who're just asking to be made into puppets, like coworkers, annoying relatives, and yourself, so you can finally learn to not do drugs from someone you trust. 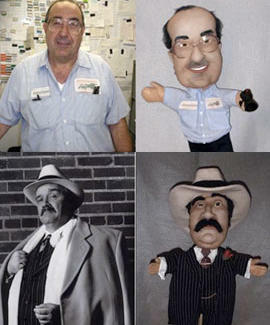 To find inspiration for your "portrait" puppet (which'll come complete with moving arms), browse online galleries of previous work, or just find an up-close photo of who you want created, which you'll email/boring-regular-mail in along with a downloaded order form outlining details and specs, i.e., clothing (overalls, suit coat, breasts with cleavage, removable loin cloth, etc), accessories (briefcase, guitar, beer bottle), and facial expression & hair type/color, because if you want it to be realistic, your stink eye and alopecia cannot be overlooked. Once you confirm your order, each puppet takes roughly 6-8 weeks to create and deliver, and carries a base cost of just $175 (clothing/accessories are extra), truly a steal considering the immense level of detail bestowed upon each piece, and the fact that you know absolutely nothing about custom-handmade-puppet pricing. If you're not ready for full-fledged puppetdom, PA also makes similarly detailed sets of 4-inch-tall finger puppets (i.e., Beavis & Butthead, Southpark, and Family Guy characters), and full-size sculptures, which're bigger standalone versions of the portrait puppets with no opening in the bottom -- and if that's how you see yourself, you've got a whole different set of needs.